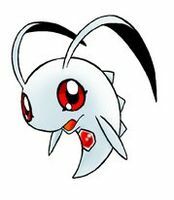 A microbe-like Digimon which was discovered in the "Net Ocean", which had long been studied as the birthplace of life within the Digital World, it has the smallest size among the many Digimon. Since it seems to be living with nothing but emotions, its behavior changes very frequently. Since it is extremely full of curiosity, it greatly wishes to communicate with the outside world, but as yet, no means to do so has been found. 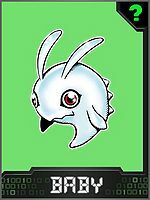 However, it is a Digimon Baby that is loved by everyone, due to its big, bright red eyes which are charming enough to shake the opponent's feelings. 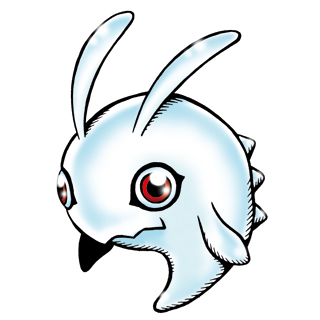 It spits out soap-like bubbles from its mouth and blinds the opponent's eyes, then flees. From pitch pitch 「ピチピチ pichi pichi」, alternatively 「ピッチピッチ Pitchi pitchi」, onomatopoeia describing splashing in puddles. Also a reference to the lyrics from the Japanese children's song Amefuri 「あめふり」 (...Pitch Pitch, Chap Chap...). Anime/Manga Digimon Adventure: "The Clashing Ultimates! War Greymon VS Metal Garurumon"
Shabon no Awa  Soap Bubbles シャボンの泡 N/A Bubble Blow Shoots a bubble-like substances from its mouth. Pitchmon is the partner of Kido Jo. Pitchmon appears in Digimon Adventure during a flashback of when the chosen Digimon hatched out from their Digitama. A Pitchmon are seen with an Elecmon and other Baby Digimon in a forest as Black War Greymon passes by. Pitchmon is the partner of Kitajima Ami. 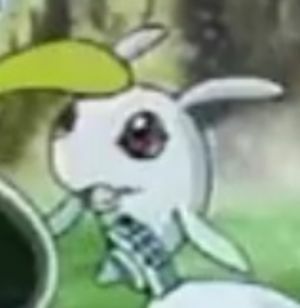 Pitchmon is an Illegal (which means mutant in the manga) Digimon and partner of Ami Kitajima. 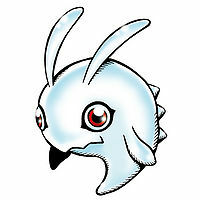 In Battle 11, it is revealed that Pitchmon carries the DigiMemory of Water and can evolve to Marin Angemon. Pitchmon is available as a Digimon Medal. 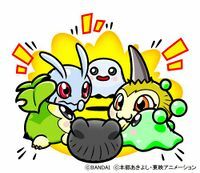 ↑ Digimon Next: "Digital World!" This page was last modified on 22 March 2019, at 20:22.